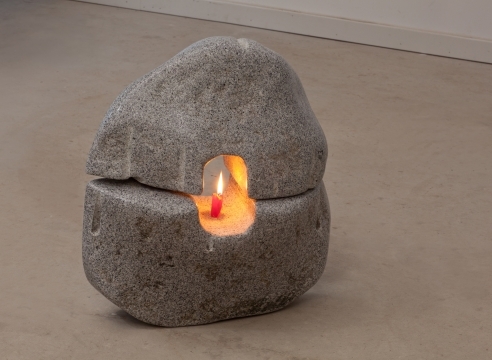 Michihiro Kosuge creates sculpture out of polished and rugged granite, manipulating the stone into a range of organic and geometric forms. His work reflects an interest in the relationship between man and nature seen in an influence by both architectural form and the natural environment. In this exhibition, The Arbor Series are columnar forms, totem-like and majestic. Their towering silhouettes stand as oversized figures, transforming the space around them. The stone surfaces are thoughtfully honed, shaped and polished using drills, blowtorches, and grinding wheels. They create a beautiful combination of solemnity and spirituality, their initial understated presence reveals, upon further investigation, a rich and profound experience. Kosuge has a unique ability to create sculptures that both define and complement the spaces they inhabit. Something that is apparent in his many successful public art projects. His sculpture, much like an archeological dig, reveals its deeper meaning the longer one keeps looking. Born and raised in Tokyo, Japan, Michihiro Kosuge first studied architecture at the Tokyo Sumida Technical School of Architecture and then went on to receive his MFA in sculpture from the San Francisco Art Institute in 1970. He began teaching art at Portland State University in 1978, becoming a full professor in 1989, and after serving three years as the Chair of the Art Department, retired in 2003. Exhibitions of his work include the Oakland Art Museum, the Portland Art Museum, the San Francisco Museum of Art, and the Seattle Art Museum. Major commissions include Highline Community College in Des Moines, WA; Kaiser Permanente Foundation, Vancouver, WA; the Little Tokyo Mall, Los Angeles; Portland Community College, Sylvania Campus; River Point Education Center, Spokane; and the Washington County Justice Center, Hillsboro, OR. Most recently, Kosuge is in the process of completing an extensive 5-piece commission for the Portland Trimet Transit Mall.